On Black Friday, that darkest day of the year for advanced shoppers like myself, I experienced the antithesis of a Wal-Mart parking lot at midnight: MIT’s 14th annual FAT (Friday After Thanksgiving) Chain Reaction, sponsored by the MIT Museum. 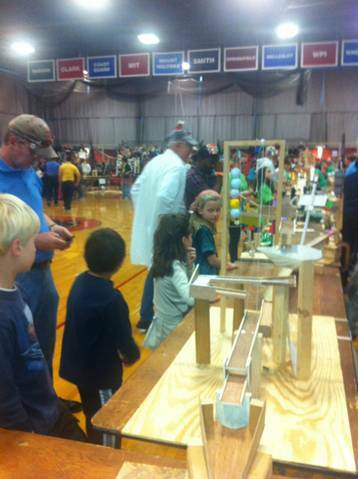 Carolyn Y. Johnson covered the event, a total nerd-aganza, in Saturday’s Boston Globe. 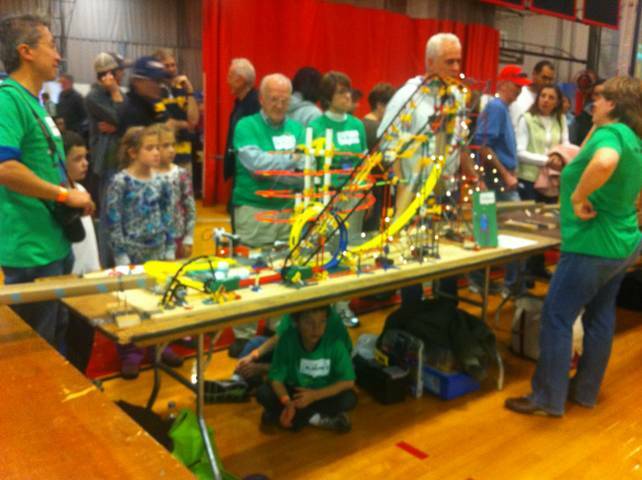 Hundreds of kids and their Rube Goldberg-inspired creations filled MIT’s Rockwell Cage Gymnasium, where kinetic sculptor Arthur Ganson emceed. Inventors explained how their contraptions worked by reading sonnets to mark the event’s 14th year (in case you slept through 9th grade English, a sonnet is a 14-line poem). After an exhibit-by-exhibit demonstration, participants connected their masterpieces with scads of string, setting off the eponymous chain reaction, a fantastical series of whirs, beeps, shooting paper airplanes, dropping feathers, flipping mousetraps and plopping golf balls that lasted 21 minutes and seven seconds. It was inspiring to see so many young people excited about science instead of dragging their moms through the mall to acquire the latest tricked-out American Girl doll. Ew! It was also inspiring to see how the kids handled the inevitable technical glitches: they just swooped in and moved things along themselves—no big deal. As Mr. Ganson described it, using the “Hand of God” to push things forward was not grounds for disqualification, harsh criticism or finger pointing. So what if something didn’t work or wasn’t perfect: you just kept calm and carried on! Imagine that, all you pepper spraying, competitive shopping “grownups”. And a joy beyond dimension. Through 14 years of invention. Have been our intrepid actors. Have been created by you chain reactors! And to tiny fingers behind a gentle prod. We see the unfolding hands of God. Remember, like our creations here, we’re all interconnected. The perfect holiday message for kids and adults alike. Even the stupid pepper spraying ones that probably don’t believe in science anyway. Or sonnets.